Anyone who reads this blog knows that we are passionate about the future of adipose stem cells. Adipose stem cells are stem cells that are derived from your own fat. Many people know about their ability to enhance fat grafts for breast reconstruction, but we hear very little in the general media about their ability to cure and treat many diseases. 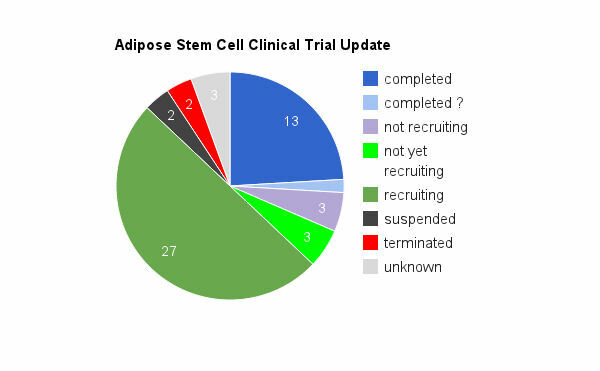 Unless you are a biotech investor hanging out in Cytori message boards, you may not know that many Phase I clinical trials with adipose stem cells have even been completed. To better understand the range of diseases being treated, I made a spreadsheet of all the clinical trials using adipose stem cells. This idea is an extension of Dr. Alexey Bersenev’s tracking of Cell Therapy Trials at his Hematopoiesis Blog. 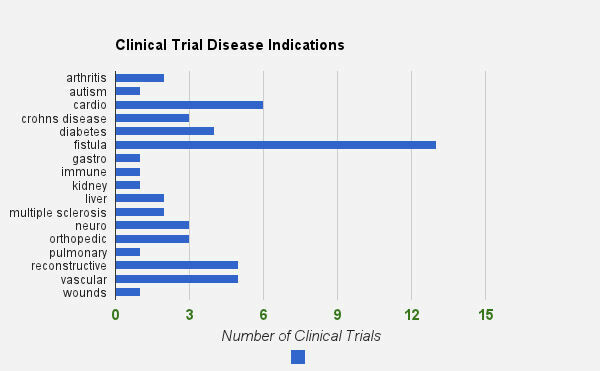 Dr. Bersenev is tracking *all* Cell Therapy trials registered since Jan 2011. Since my interest is primarily adipose stem cells, my spreadsheet tracks all clinical trials using only adipose stem cells since 2004. My thanks to Dr. Bersenev for setting up a great framework to build upon! Each week I plan to publish data or charts from my spreadsheet. The charts below represent a few data sets from the spreadsheet. I have read and collected info about each clinical trial to include sponsor, trial status, country, donor source, disease indication, cell expansion, stem cell dosages, etc. so this could get very interesting! Not to be missed next week is the ‘sponsor’ who has 10 clinical trials registered for several different disease indications. It is amazing what one finds buried in those documents. There are not only scores of adipose stem cell clinical trials that are ongoing, but many have already been completed. By my count, a total of 54 clinical trials using adipose stem cells have been registered with the clinicaltrials.gov database. This database houses all of the trials registered by the FDA and the NIH. A total of 13 trials have been completed, and 27 are actively recruiting. The remaining trials have various statuses. Keep in mind that this does not include trials registered at the many other country specific databases. Likewise, it does not include the pre-clinical studies that take place prior to registering for a clinical trial. The endpoints of many of these completed trials is the determination of ‘safety’ and ‘efficacy’. To make a long story short, all completed studies determined that therapies using adipose stem cells are safe. While breast reconstruction using adipose stem cells has gotten a lot of media attention because of Suzanne Somers’ experience, there are adipose stem cell clinical trials ongoing for many diseases. These include arthritis, autism, cardio, crohn’s, diabetes, fistula, immune, kidney, liver, multiple sclerosis, neuro, orthopedic, pulmonary, vascular and wound care. Below is a summary of trial numbers for each indication. A LOT is going on! Clinical trials use either Stromal Vascular Fraction (SVF), or the cells are Culture Expanded. Trials that use SVF isolate the stem cells from the fat removed during a liposuction procedure. Doctors then use those stem cells in the same operative session as the therapeutic treatment. The process of isolating the stem cells takes about an hour. It can be done manually or with special devices like the Cytori Celution machine. When trials use culture expanded stem cells, this means the cells can not be used on the same day as the therapeutic procedure. Cell culture expansion takes place in a GMP lab and can not be done in one day. Culture expansion of cells can take several weeks depending on the number of cells needed. Trials that use culture expanded cells need high cell counts, as well as certain phenotype populations of stem cells. The chart below indicates that both methods of cell preparation are being used in trials. As time goes on, I will continue to slice and dice this info according to disease indication. I welcome your feedback and clarity as I plan to expand my database to include the WHO, and country-specific databases. Another big thanks goes to my Googley son who works in Mountain View HQ. I would not have been able to figure out all the magical charting features of Google spreadsheets without him! Part 1: You just read it! Part 2: Adipose Stem Cell Clinical Trials by Donor Source, Autologous vs. Allogeneic – What’s up with that? These are some good charts. I have to say this is very interesting to me. hi Richard, Can you share any details with us-? Are you part of a clinical trial? Were your injections intravenous? autologous? tissue source? We wish you all the best. Please keep us posted on your progress. I have SPMS with 6 adipose treatments so I have an idea how effective it may be. excellent chart whoich clearly indicates the potential short and long term. also is encouraging as an investor. please keep me posted I appreciate your excellent work.